Add all ingredients to a 2 or 4 quart slow cooker*. Stir. Cook on low in the slow cooker 6-8 hrs on low. When done, meat should shred easily. Remove the chicken to a platter. Use two forks to pull apart. Mash the contents of the slow cooker. Return the chicken to the slow cooker. Toss to evenly coat with sauce. Serve on rolls. *Make sure that the slow cooker is 2/3-3/4 of the way full. Any less and your food will not cook evenly. There was a cute little chicken farm not far from where we used to spend a lot of summer days on the river in the tiny, cold water and outhouse-only cabin my grandpop bought back in the '60s when my mom was a child. Now the the cabin is gone and my parents live there in a modern house and the chicken farm has been converted into a large farm store. They have local produce for sale and a lot of other locally produced items. They still sell award-winning eggs and lots, and lots of poultry. I love shopping there because it like going to the farmers market but it is open every day and I don't have to get up the crack of dawn on Sunday and drive across town. Last time I was there I loaded up on turkey sausage, turkey breast, ground turkey thighs and these tasty chicken thighs. 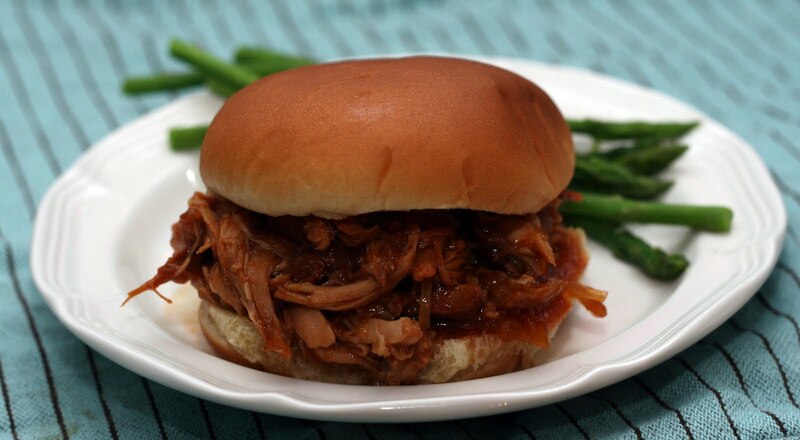 You all know I love pulled pork and pulled chicken is a good alternative. Thighs shred nicely and unlike breasts, they do not tend to dry out even if you cook them a long time. This recipe is super easy, the chicken stays juicy and it uses up some of the jam that if you are like me, you have been hoarding. I liked it served on rolls but I bet it would make awesome pulled chicken nachos.